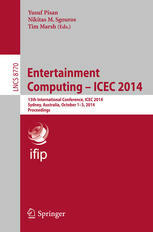 This book constitutes the refereed proceedings of the 13th International Conference on Entertainment Computing, ICEC 2014, held in Sydney, Australia, in October 2013. The 20 full papers, 6 short papers and 8 posters presented were carefully reviewed and selected from 62 submissions. In addition to these papers, the program featured 3 demonstration papers, and 2 workshops. The papers cover various aspects of entertainment computing including authoring, development, use and evaluation of digital entertainment artefacts and processes.